United Launch Alliance have launched the third X-37B mission from Cape Canaveral Air Force Station. Liftoff of the spaceplane, aboard an Atlas V 501 from Space Launch Complex 41, is scheduled for 18:03 UTC (13:03 EST). The X-37B Orbital Test Vehicle 3, or OTV-3, mission is the third spaceflight of the X-37 programme, and will use the same spacecraft which flew the OTV-1 mission, making it the first X-37B to be reused. Reusability has always been a goal for the programme, however further flights were uncertain before the success of the first mission. Upon reaching orbit, it is expected the mission will be redesignated USA-240 in keeping with the designation system used for many large US military spacecraft; the OTV-1 and OTV-2 missions were known as USA-212 and USA-226 respectively. The mission is being conducted by the United States Air Force’s Rapid Capabilities Office, which will use the spacecraft for classified research; believed to be technology demonstration for future spacecraft. The X-37B was designed to operate for up to 270 days in orbit; however the OTV-2 mission appears to have extended this by around 180 days, following its 468 day flight which concluded in June. 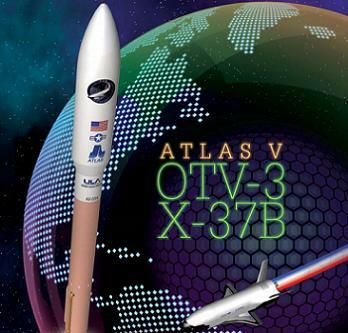 It is unclear how long OTV-3 is intended to remain in orbit, however once the mission is complete the spacecraft is expected to land at Vandenberg Air Force Base, California. Edwards Air Force Base is considered a backup landing site. The X-37B, which was constructed by Boeing, is 8.9 metres (29 feet) long, has a wing span of 4.5 metres (15 feet) and a height of 2.9 metres (9.5 feet), with a mass of 5,000 kilograms (11,000 lb). Power is provided by lithium ion batteries charged by a gallium arsenide solar array which will be deployed shortly after launch. The X-37 programme was started by NASA, but taken over by DARPA, the Defense Advanced Research Projects Agency (DARPA) in 2004. Drop tests of the X-37A variant began in April 2006, with development of the operational X-37B variant beginning the same year. The X-37B made its first flight in April 2010, with OTV-1 launching aboard an Atlas V.
The first mission lasted seven months, landing in December 2010 at Vandenberg. It was followed three months later by the second mission, OTV-2, which launched in March 2011. This mission remained in orbit for 15 months, finally landing on 16 June this year. Details of both missions are classified, however they are assumed to have been successful, and the vehicles were both recovered intact. Although the X-37 was originally designed to be launched by the Space Shuttle, and later the Delta II, the restriction of the former to ISS assembly, and aerodynamic issues with the latter, resulted in the Atlas V being chosen to carry it to orbit. The 501 configuration is used, which consists of a Common Core Booster first stage, with a single-engine Centaur upper stage, no solid rocket boosters, and a five metre (16 foot) diameter payload fairing large enough to encapsulate the X-37B, negating any aerodynamic effects it may otherwise have had upon its carrier rocket. The Centaur is also encapsulated by the payload fairing. 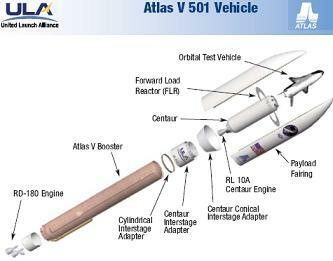 The Atlas V that launched OTV-3 had the tail number AV-034, and was the thirty fourth Atlas to fly; the fourth to use the 501 configuration. The first stage, or Common Core Booster (CCB), is fuelled by RP-1 propellant, oxidised by liquid oxygen; a Russian-built RD-180 engine provides the thrust. The RD-180 ignited 2.7 seconds before the countdown reaches zero. At T-0 the engine was ready for liftoff, which will came 1.1 seconds later when the thrust it was generating exceeded the weight of the fully fuelled rocket. A second after liftoff, the engine reached maximum thrust. After climbing vertically until T+18.3 seconds, the Atlas began a series of pitch, yaw and roll manoeuvres to align itself to the necessary trajectory for its ascent into orbit. At T+83.1 seconds passed through the sound barrier, and six seconds later it encountered the area of maximum dynamic pressure, or max-Q. Once AV-034 reached space, the atmosphere became sufficiently sparse that the fairing was no longer be needed to prevent the X-37 affecting the rocket’s aerodynamic profile, and it was jettisoned to reduce the vehicle’s mass. While payload fairings are usually present to protect the payload from the atmosphere during ascent, this was not necessary with the X-37B as it was designed to launch without a fairing on the Delta II – this being abandoned due to concerns that the rocket would be unable to cope with it. Fairing separation was 216.2 seconds after launch, and five seconds later the forward load reactor, a device used to dampen vibrations within the fairing, also separated. First stage engine cutoff, or BECO (Booster Engine CutOff), came four minutes and 23.2 seconds after launch. The first stage was jettisoned six seconds later, with the Centaur continuing the mission. The Centaur is a single-engine upper stage, powered by an RL10A-4-2 engine. The RL10A is similar to the RL10B used on the second stage of the Delta IV, which resulted in delays to the launch after a problem during the previous Delta launch. The RL10A burns liquid hydrogen propellant, and like the first stage it uses liquid oxygen as an oxidiser. Centaur ignition occurred ten seconds after staging, with the stage making a 13 minute, 55.3 second burn, to inject the X-37B into low Earth orbit. Spacecraft separation will presumably occur shortly afterwards. The launch of OTV-3 was the first to be conducted by United Launch Alliance in over two months; the last being the 4 October launch of a Delta IV Medium+(4,2) with USA-239, or GPS IIF-3. Although this launch was successful, a fuel leak during early in second stage flight led to reduced performance, and although the Delta was able to compensate for this, if it hadn’t been carrying a comparatively light payload, giving the rocket a large performance margin, the launch would likely have failed. Tuesday’s launch also marked the last US launch of 2012. In all, the United States have made thirteen orbital launches this year, beginning on 20 January with a Delta IV carrying WGS-4. This was followed by an Atlas V with MUOS-1 in February, another Delta IV with NROL-25 in March, and an Atlas V with AEHF-2 in May. Later in May, SpaceX launched a Falcon 9 with the second Dragon spacecraft, on the Dragon C2+, or COTS-2+ mission; becoming the first commercial spacecraft to dock with the ISS. Three launches occurred in June; Orbital Sciences launched NuSTAR with a Pegasus-XL on 13 June, with ULA launching an Atlas V on 20 June, and a Delta IV Heavy nine days later, both carrying payloads for the US National Reconnaissance Office; NROL-38 and NROL-15 respectively. August saw the launch of an Atlas V with NASA’s Radiation Belt Storm Probes, with the NROL-36 mission which had originally been scheduled to launch before RBSP, launching in September. The last Delta IV launch of the year was the GPS launch on 4 October, and this was followed four days later by a Falcon 9 with another Dragon spacecraft bound for the ISS. America’s next scheduled launch is of an Atlas V on 30 January, carrying NASA’s TDRS-K communications satellite. A date has not yet been set for Orbital Sciences Corporation’s test flight of the Antares rocket, however, so this could possibly fly before that date.